In the late 1950’s and early 1960’s, hazy skies were just a normal side effect of the growing economy, but quickly became associated with illness. In 1961, Chattanooga was the third worst city in the nation for particulate pollution and by 1963, the mortality rate from tuberculosis was three times the national average. Citizens were ready for a change, but it took seven years and a designation that no city wants to make it happen. 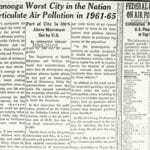 In 1969, the Department of Health, Education and Welfare (HEW) named Chattanooga the “worst city in the nation for particulate air pollution.” Chattanooga had a heavy industrial base, and unregulated emissions from industries, railroads, and coal furnaces caused high concentrations of particulate matter. Chattanooga’s topography compounded the problem by causing temperature inversions (during which cold air flows over the mountains into the valley and is trapped–with the pollution–by a layer of warm air). These factors, along with deteriorating scenic views and rising national claims of pollution-related sickness, prompted the citizens, government, and industrial leaders in Chattanooga and Hamilton County to take drastic measures. They proposed air pollution control regulations. These measures had been debated for years, but suddenly became a priority. 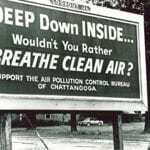 Chattanoogans approved a new Air Pollution Control Ordinance in late 1969. This aggressive legislation, which created the current Air Pollution Control Board and Bureau, set restrictions on almost all pollution-causing activities in the county, including placing limits on visible emissions from local industries. The Ordinance set an attainment date for October 14, 1972. Incredibly, in that three-year period, every major pollution source in Hamilton County was in compliance, at a cost of over $40 million. 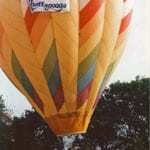 This tremendous achievement received national attention and was celebrated with “Clean Air Week” during October 1972. The city celebrated again in 1989 when Chattanooga’s air quality met all federal health standards. It was a huge milestone for both the Air Pollution Control Board/Bureau and Hamilton County. Chattanooga continued to meet the federal health standards until federal regulations were tightened in 1997. While Chattanooga’s air was cleaner than it had ever been, the growing awareness of the link between air pollution and illness caused the government to make air quality standards more stringent. The new standards put Chattanooga in jeopardy of losing their “attainment” status. The Environmental Protection Agency (EPA), working with environmental groups and air pollution organizations, created a way to achieve cleaner air faster – areas destined to be out of compliance with federal standards were allowed to form Early Action Compacts (EAC). These compacts were agreements to take voluntary measures to clean up the air. Chattanooga’s EAC went into effect in 2004.
lowering truck speed limits on the interstate. After being designated in “attainment” for ozone, Hamilton County was in a position to compete for new industry. When a city is out of compliance with the ozone standard, any new industry that comes to a city must install additional pollution reduction equipment to comply with the regulations, resulting in a greater cost to the industrial company. Just one year after attaining the federal standard for ozone, Volkswagen was looking for a city where they could build their new vehicle assembly plant. They chose Chattanooga to be that city! If it wasn’t for the air pollution control methods implemented in 2004, Chattanooga would not have been able to acquire the Volkswagen assembly plant. Later that year, just as Hamilton County met the tightened federal standard requirements, the EPA decided that the regulations were not stringent enough to reduce pollution-related illnesses, and lowered the standard again. This meant that Hamilton County was once again out of “attainment”. This time, with several air pollution control methods already in place, Hamilton County was moving in the right direction. In addition to Hamilton County’s EAC control methods, EPA required vehicle manufacturers to add ozone pollution controls to new vehicles, reducing pollution over time as older vehicles would be replaced with newer ones. This helped Hamilton County to reduce air pollution emissions even more. In 2010, Hamilton County was once again designated in “attainment” for ozone. EPA lowered the federal health standard for ozone a third time, determining that the previous threshold was not stringent enough to protect Americans from air pollution illnesses. This time, Hamilton County was already meeting the new standard. Hamilton County’s air is cleaner than ever, but this doesn’t mean we can stop what we have started. It is important for our community to continue the control methods from the EAC. Without the help of our citizens, it would be impossible to keep our air clean. choosing alternatives to burning brush (wood chipping, brush pick-up services). Without the cooperation among government, industry, and concerned citizens, the progress Chattanooga has made would not have been possible. Please help us make air pollution history in Chattanooga and Hamilton County now and for generations to come. Download our history book, A History of Air Pollution Control in Chattanooga and Hamilton County.